Two weeks ago (January 11th) CameronBanga.com’s staff got together with one goal in mindâ€¦to play four 3D Zelda games including Ocarina of Time, Majora’s Mask, Wind Waker, and Twilight Princess within 48 hours. Quite the challenge when you weigh the odds. The Four48 team set up a live streaming webcam in preparation for maybe a handful of people. Little did they know that overÂ 80,000 people from over 100 countries would tune in to give their full support with fan art, emails, stories and more. Things really went wild when the team opened up a PayPal donation for Pizza. At first it was a few dollarsâ€¦then 50, 100, 500, and pizza money just kept poring in to total over $1200 in donations. TheÂ Four48 team then made the decision to donate all proceeds to Penny-Arcade’s Child’s Play. JB: First I’d like to congratulate you and your team on the amazing 1200$ charity collection. Did you ever expect all the support that came from doing a weekend long speed run? CB: Definitely never expected nearly the amount of support we received that weekend. I’ve been around the internet long enough to understand that everyone is a cynic and expected some pretty harsh responses to our quest. But after 7000 e-mails in the 48 hours, 99.9% of which were extremely positive, we definitely felt like we did something people truly enjoyed. JB: To give credit where it is due, who all participated in the event? CB: We have a pretty large team all-in-all. We have 11 people on staff in total. Some guys focus on selecting the games we will play, others work reading e-mails, we also have a couple who just offer moral support and stay up late each night. However, each person is a pretty integral part of our success. The entire team consists of Michael Boersma, Dillon Carter, Matt Green, Natalie Nhok, Tom Platte, Will Scheller, Adam Shull, Dean Siemon, Mike Stecyk, Chris Vavra, and myself. JB: What was your motivation for trying to complete such a daunting task? CB: This is kind of a funny story and definitely one which is way too simple for such a large undertaking. Last semester, I was sitting in our University library studying for finals. I had some Zelda music from ZREOmusic.com playing on my iPod and I thought to myself, it would be sweet to spend a weekend early in the next semester playing Zelda with my friends since we all get pretty busy at the end of semester and don’t have time to hang out with each other. Thus, the adventure began. JB: As a group of speed-run ninjas, what other titles have any of you completed via speed-runs? CB: Personally, I have never really been into the speed run scene before now. I guess I was just never that skilled of a gamer. A couple of guys on our team have tried speed runs, but none of us would be considered world-class gamers by any imagination. The games we have completed via speed runs are all the Zelda games we completed in the last two weeks. 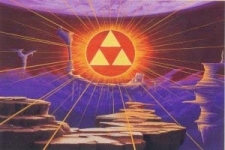 JB: As a huge Zelda fan myself, I totally understand why you chose the Zelda franchise for a challenge, but what are your future plans for other speed-run challenges on Cameronbanga.com? CB: Well, we would like to continue working to raise money for Child’s Play through gaming. We have a goal of raising $10,000 by year end and we feel our weekly gaming will help put us real close to that goal. We also hope to maybe get into podcasting as well as expanding upon our forums and as a gaming review site if at all possible. I find $1200 charity dollars raised via gaming marathon quite the accomplishment. If youâ€™re interested, the 448 team will be playing through Paper Mario on Saturday, January 26th at 10AM CST. Just visit CameronBanga.com for the live web stream and donation info. Written by: Jake on January 25, 2008.